First part of the big TV Show filmed at Oantu School by the Tv station TLM Plus - a very good example of dissemination of the multilateral project. National Symposium at Piatra-Neamt: Roxana Elena Irina has presented in detail our project. Article about the project issued in the newspaper "Monitorul"- Neamt Dept. 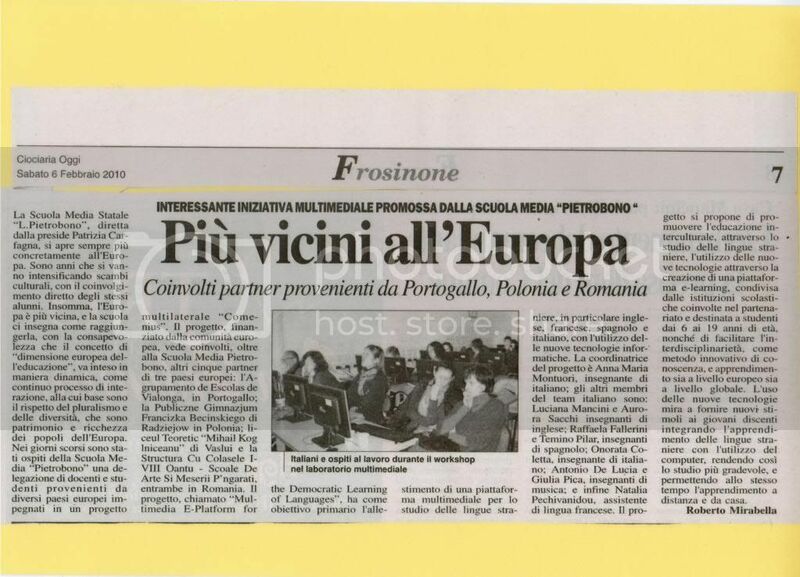 Article about the multilateral Comenius project "Multimedia e-Platform for the Democratic Learning of the Foreign Languages" issued in the newspaper "Monitorul" of Neamt Dept. Article about the project issued in the newspaper "Monitorul"
Dissemination in the Multilateral Comenius project Multimedia E-Platform for the Democratic Learning of the Foreign Languages, made by Roxana Elena Irina - the 4-th edition of the magazine "Modern School". The Magazine "Modern School" is edited by the Departmental Center for the Teachers Ressources - Neamt - Romania.